I forget the exact setup, but the standard joke is a musician on the streets of New York asks, “How do I get to Carnegie Hall?” and the reply is, “Practice, practice, practice.” From the research widely publicized by Malcolm Gladwell, we know that in order to become an expert at just about anything, it requires 10,000 hours of practice. While I’m sure I’ve put in at least that much time at the organ, I’m still looking for opportunities to improve and learn more. Last week, I had the opportunity to attend the symposium on French music and improvisation at Rice University. Featured on the schedule were performances by Ken Cowan, George Baker, Tom Trenney, Johann Vexo, and Philippe Lefebvre. Because I had worked with Philippe Lefebvre previously, I was very excited to see him again and to see what new tips and tricks he might have to share with us this time. The instrument for the class was C.B. Fisk, Inc. Opus 109 / Rosales Organ Builders, Inc. Opus 21. When I was looking for someone to build a French-style instrument for the Cathedral in Albany while I was music director there, I heard a great deal about this instrument, so was delighted to finally be able to see and hear it. It is decidedly well-suited for the French repertoire and offered many tantalizing sounds for the concerts and masterclasses. One of the elements that Philippe Lefebvre shared with us in the final improvisation masterclass was how he searches for new and different sounds at the organ. Most organ stops have very traditional uses and functions, however, he encouraged us to consider non-standard uses and registers. Instead of using the 8′ Harmonic Flute as the solo, why not try the 2′ Octavin played two octaves lower? Or the Quint or Tierce by itself as a solo stop? I have always been attracted to the organ because of the variety of colors available, but Philippe showed us an even wider palette of possibilities! 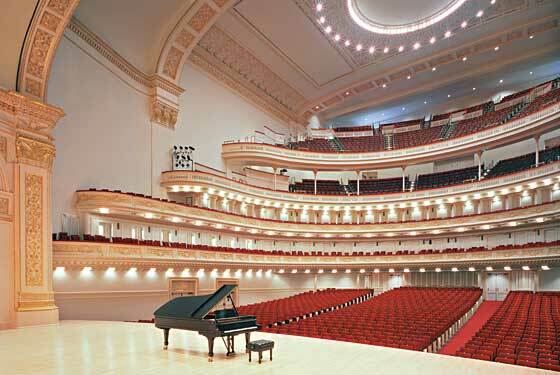 While many musicians are accustomed to practicing repertoire (after all, how else will they get to Carnegie Hall? ), many seem confused at the idea of practicing improvisations. Aren’t improvisations supposed to be “instant music” created on the spot? How can you ever practice such a thing? The truth is that to do it well, those same 10,000 hours of practice are required. Any one who has attempted to learn a foreign language should recognize the difference between being able to read or pronounce what they see on the page and being able to carry on a conversation. For me, musical improvisation is being able to carry on a conversation. We have to learn the rules of grammar and be able to apply them spontaneously to convey our thoughts in a way that is meaningful to the listener(s). Just as a child learns to spell, we must learn how to spell musically. Which notes will follow in what order to create what words? How do we fit the words together to make sentences and paragraphs? These are all items that we must study and practice if we are to improvise well. The concert by Philippe Lefebvre at Rice was one of the best organ recitals I have heard in quite some time. He took us through a Sunday at Notre Dame, sharing both improvisations and repertoire that reflected the typical activities of the day. Having heard him play there, I truly felt like I had been transported to Paris for the evening! Thanks to the marvels of YouTube, we can all visit Notre Dame from the comfort of our own homes without any jetlag! 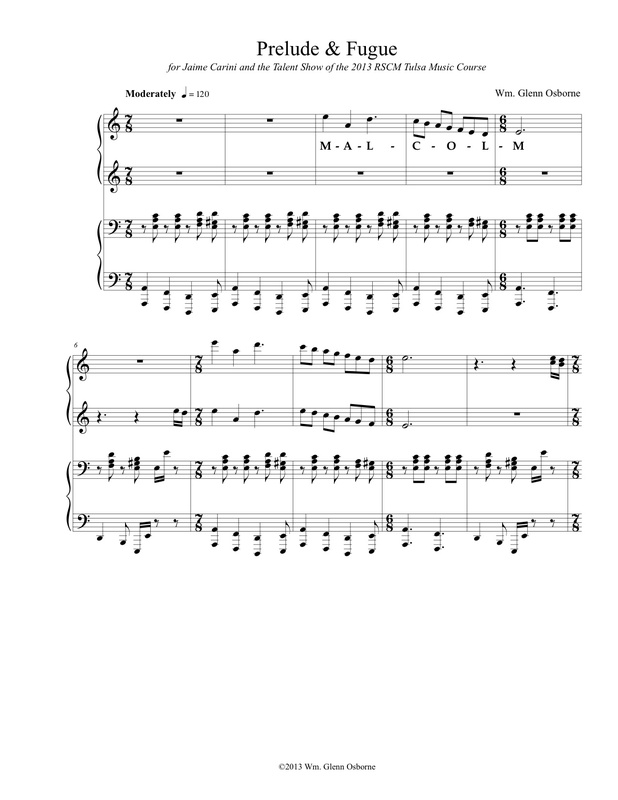 Below is a fugue that Philippe improvised for Communion at Notre Dame. Enjoy the music and keep practicing! Recorded live at the 2013 Basilica Christmas Concert, William Picher conductor. The score is available here, and the CD can be purchased here. Included as part of the week’s activities was a talent show on Saturday evening. After deciding to perform a piano duet with another participant, I offered to write a piece for us to play. In addition to themes from the pieces listed above, I included a musical rendition of the name of our conductor for the week: M-A-L-C-O-L-M A-R-C-H-E-R. I was a little concerned about meeting the deadline with so little free time in between and after rehearsals, but I think the piece was clearly a success, especially for all those who recognized the theme citations. The video below was recorded on my iPhone. Enjoy! While looking around on-line today, I discovered that TampaKurt had posted videos from the Festival Singers of Florida concert in January. The video playlist includes 11 selections from The British Way! and may be seen here. It was a pleasure to work with Dr Kevin Fenton and the Festival Singers. Join us as the Festival Singers of Florida, conducted by Dr. Kevin Fenton, celebrates British Choral music, including Vaughan Williams, Taverner, and the newly composed Missa Brevis by Jonathan Dove. The “crowning moment” will surely be the Rutter Gloria, including full brass and organ. Also included will be “Let the People Praise Thee, O God” by William Mathias. While preparing the piece, I discovered this recording done by fellow Westminster Choir College alum Mark Husey at Saint Peter’s Catholic Church in Columbia, South Carolina. Enjoy! I had my first organ lesson at Woodland Presbyterian Church during the fall of my freshman year of high school. The instrument is Op. 758 of the Austin Organ Co. from 1917 with some revisions in the 1980’s by Milnar Organ Co. Though I haven’t played regularly at Woodland for over twenty years, because my parents are still active members there, I still get to stop by and play the instrument when I go home to visit. This time, we brought along a video camera and recorded a few repertoire selections. Below is a piece by American composer Dan Locklair: “The Peace may be exhanged.” from Rubrics. This is a second video with excerpts from wedding music selections. It offers some alternative traditional selections. I made these two videos for couples who are preparing to get married at Holy Redeemer Catholic Church, especially those who reside out of town. The first video presents the most popular traditional music options. Here’s a clip from the recent Vierne concert at St. James Cathedral. Dividing the organ into the grande orgue and orgue de choeur proved to be challenging. While planning for the installation of the instrument, this was one of the pieces that I envisioned performing in order to work out all the little details necessary for the two consoles to function at the same time. How thrilling it was to actually hear the piece come to life. Thanks to David Brunner, Ben Lane, the CFAGO and all the singers for making this vision a reality. Kyrie from Messe Solennelle by Louis Vierne from Karen Osborne on Vimeo. The audio is from the in-camera microphones. Once I get the professional audio, I’ll update this with better sound.